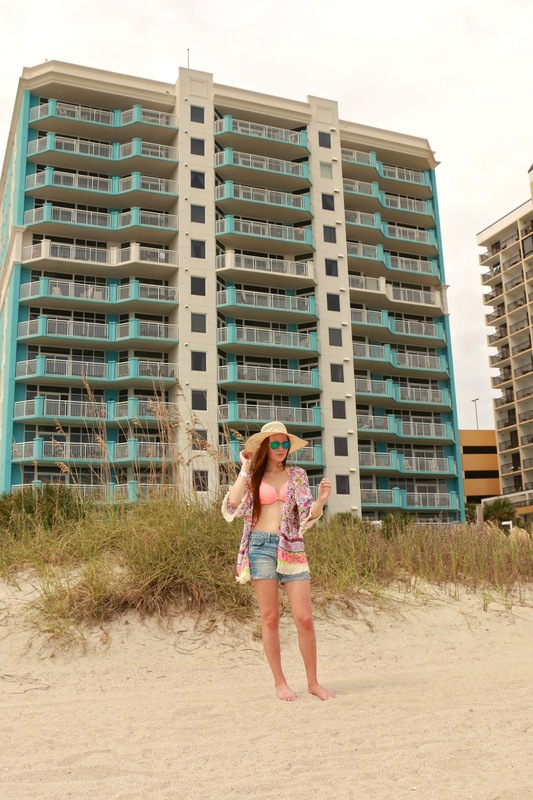 Spending Labor Day Weekend in Myrtle Beach was the perfect opportunity for me to break out my most summery outfits for one last go-around before the season ends! My girlfriends and I spent two full afternoons at the beach, so I made sure to pack more than enough of my favorite bathing suits. This was the outfit that I wore to the beach on my actual birthday, which was on Sunday. I bought this gorgeous kimono when I was in France earlier this summer, and other than wearing it to my summer job a handful of times, I had been saving it anxiously for my beach trip! I have been looking for a great kimono for a long time- I wanted one that had pretty colors, was a flattering fit, and wouldn't break the bank since kimonos are a trendy piece! I never thought I would find what I was looking for in Europe, but I'm so glad that I did! It's become one of my favorite souvenirs. I'm also equally obsessed with this Forever 21 bikini. For both the top and matching bottoms (not pictured) I spent under $25, and the quality of this swimsuit is fantastic! I bought a few things from Forever 21's swimwear department this season and I was very impressed with the quality- I think they're definitely stepping things up for their swimwear! And lastly, you can see in these pictures that I enjoyed taking advantage of Myrtle's open container laws on my birthday. :-) The ABC stores closest to our hotel were all closed on my birthday since it was on a Sunday (SC has stricter alcohol sale laws then some other states), so I didn't get to go to any stores to by alcohol. But I sure had fun drinking hard lemonade out of the Lilly koozie that I've been saving for this occasion, and also ordering my first legal drink at dinner that night! Are you sad to see the end of summer and saying goodbye to beach attire? Or are you ready to embrace Fall with open arms? That last picture literally looks like a professional ad! So pretty! THESE PICTURES ARE PERFECT. You are gorgeous. And I love you. I cannot wait until we go on our own adventures. Gorgeous! And I'm in love with your kimono!